Niagara Falls, NY - Niagara Falls Mayor Paul Dyster and Richard Bird, the 2018 Grand Marshal for the Ancient Order of Hibernians St. Patrick Day Celebration on Saturday, raise the Irish Tricolour at City Hall, to mark the St. Patrick's Day holiday. 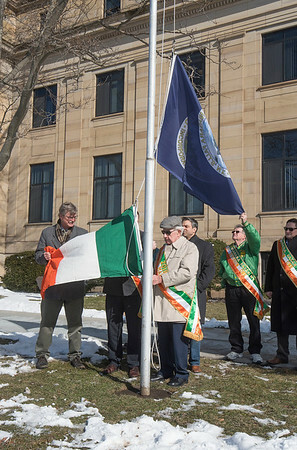 Niagara Falls, N.Y. - Mayor Paul Dyster will join members of the Niagara Falls chapter of the Ancient Order of Hibernians on Friday, March 16 for the annual raising of the Irish Tricolour at City Hall to mark the St. Patrick’s Day holiday weekend in the City of Niagara Falls. The AOH will celebrate their annual St. Patrick’s Day party on March 17 at 5 PM at the Conference & Event Center Niagara Falls, kicking things off with the world’s shortest parade at 4:45 PM. The family-friendly event also coincides with the city’s 126th birthday.